On smaller mobile screens, it may be necessary to scroll left and right in the boxes below to see all the delivery information. Standard delivery areas vary between brands. Please call 01302 741 709 with your basket contents and post code to check that you are in our standard delivery area. Please see individual sink and tap products for delivery prices. Offers current at the time of publishing. Please see the Special Offers page for a list of current offers. Please note that the standard delivery charge areas vary depending on which products are ordered. 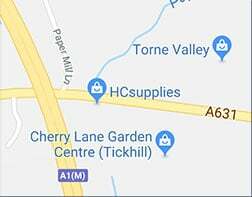 Please call 01302 741 709 prior to ordering to confirm that you are inside our standard delivery area for the products that you require. If you are outside of our standard delivery area we can usually offer a third-party courier option however this can sometimes attract a surcharge. All worktop, breakfast bar, splashback and upstand deliveries require an able-bodied person present to accept the delivery and help the driver lifting the worktops. Once you have placed your order, you will usually receive a text message and email within 2 working days confirming your delivery date. We are pleased to offer a free collection service from our showroom in Doncaster however you must place your order first and select collection on the checkout page. We will then order the goods into our Doncaster showroom(the standard delivery timescale applies) and we will call you once the goods are ready for collection. Please note that for very large items we may not be able to offer a collection service, please call 01302 741 709 to confirm. Please note that as all products have to be special ordered in to our Doncaster address, we are unable to accept cancellations of these items. Please call 01302 741 709 prior to collection so that we can ensure that the items can be collected.